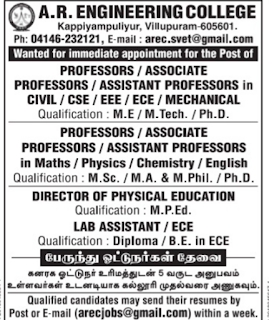 A. R Engineering College, Villupuram has advertised in THE Dinamalar newspaper for recruitment of Professor,Associate Professor, Assistant Professor, Lab Assistant jobs vacancies. Interested and eligible job aspirants are requested to apply with in a week. Check out further more details below. A.R. Engineering College is one of the institutions of Sri Venkatachalapathy Educational Trust was started on 2008 at vadakuchipalayam, Kappiyampuliyur post, Villupuram with the goal to stress the prime values namely Integrity, Transparency, Accessibility, Equity, and Quality. The college is affiliated with Anna University of Technology, Chennai. 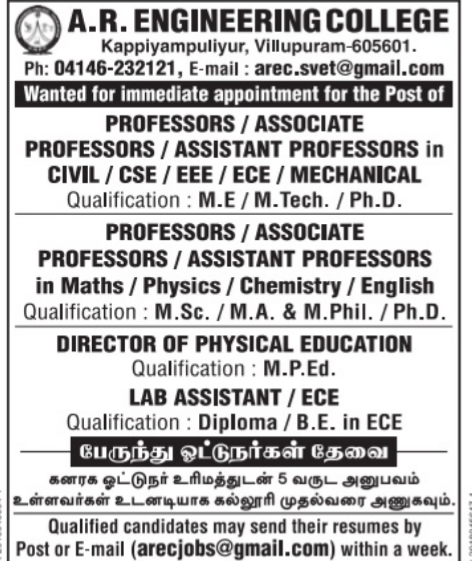 The college has grown considerably under the dynamic leadership of its Vice Chairman Sri.M.Kuberan and Principal Dr.S.Padamalal, spear heading all academic and non academic activities..
How to apply: Interested and eligible candidates may send their resume by post or mail arecjobs@gmail.com with in a week.